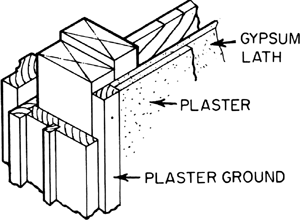 A metal angle bead that is a built-in edging, reinforcing a plaster angle; a corner bead. Barnicot came down this morning he was astonished to find that his house had been burgled during the night, but that nothing had been taken save the plaster head from the hall. But, in recent years, the huge model had disintegrated and all that was left of him was his plaster head, hands and boots. A plaster head "This is of my late mother-in-law, aged nine, sculpted by a family friend, Alexander Proudfoot, when he was staying in Kirkcudbright in 1924. One portrait machine consisted of a pantograph (a device pioneered in the 17th century) which used a gel pen to sketch the outline of a plaster head. I liked Saranjit Birdi's Interrogation, in which unseen hands play a rhythmic tattoo with drumsticks on a classical plaster head which gradually disintegrates under the impact. A white plaster head, the kind you find in traditional art schools for drawing practice, sits on the mantel, looking down at the girl waiting in ambush. They used the molds to make a plaster head and hands for the figure. Using the molds, they made a plaster head and hands for the figure. We had to make a full plaster head cast of Emma Thompson," he says. He himself reclined on the brass bed with one arm resting on a plaster head copied from Praxiteles. Nadelman regularized the features of the head from the angular and expressive work of 1908 (like his raffish plaster Head, recorded in a photo, since destroyed) down to the smoothed-out haircuts, braids, and barrettes of 1910 to 1913 (the many Classical Heads of c.
DALEKS, a plaster head of King Edward VII and Roald Dahl's entry in a school register all form a colourful new exhibition about Llandaff opening today at The Cardiff Story.